Sinor, Siner, Sinah & other spellings, sometimes used by the same person, or those attempting to record their name. 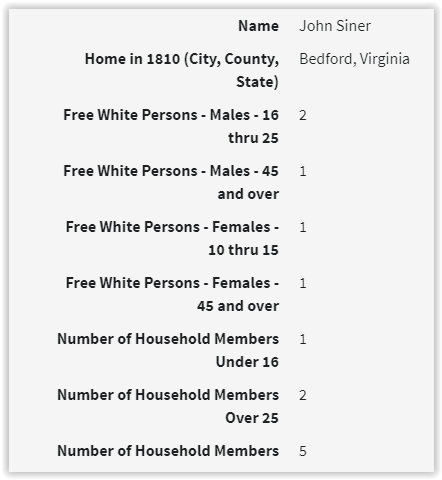 BEWARE: Please note that the records given here may or may not accurately be parental information for John Siner/Sinah, Sr., the Revolutionary War soldier. 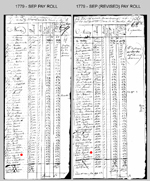 Records from databases associated with the LDS church such as found on ancestry.com and familysearch.org, are often compilations of data submitted by members. With the advent of the Internet, such databases have become less and less reliable while becoming more and more available. 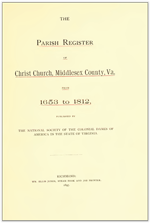 Additionally, as an example, the book excerpt from the Parish Register of Christ Church in Middlesex County, Virginia, published in 1897 gives but scanty information using a spelling of the Sinor name other than Sinor. 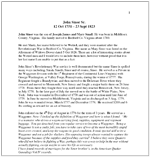 Supporting the spelling given there are the Revolutioinary War military service records of John Sinah; whose name also appears in those records occasionally as John Siner (in the same regiment and company with the same soldiers as peers). To date, I haven't seen any solid documentation that Mary, wife of Joseph Sinah, was the widow of a Mr. Small. 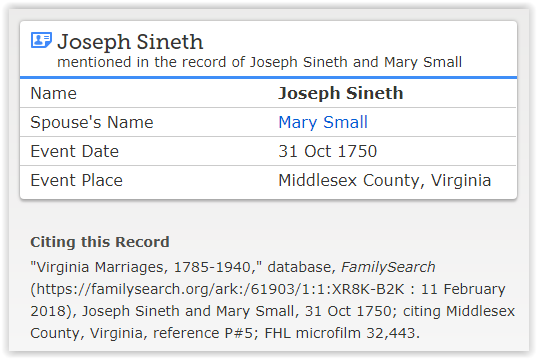 The record image shown here, offering Joseph Sineth married to Mary Small is an LDS-related databse record, existing primarily because this information was submitted by someone. 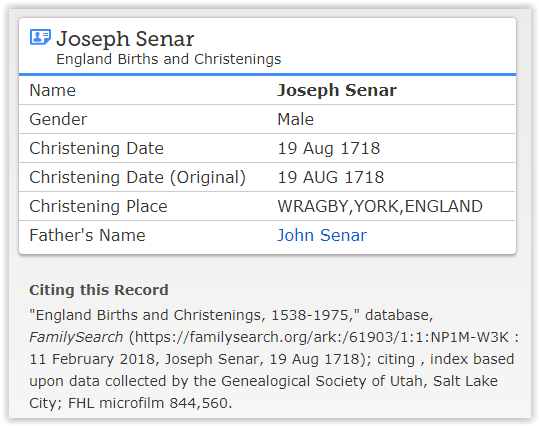 Other LDS-related database records give Joseph as being born 19 Aug 1718 as a son of John Senar in Wragby, Metropolitan Borough of Wakefield, West Yorkshire, England. The same database gives a John Senar born in York in 1640. Although possible, it is unlikely that John Senar at age 78, had a son Joseph. 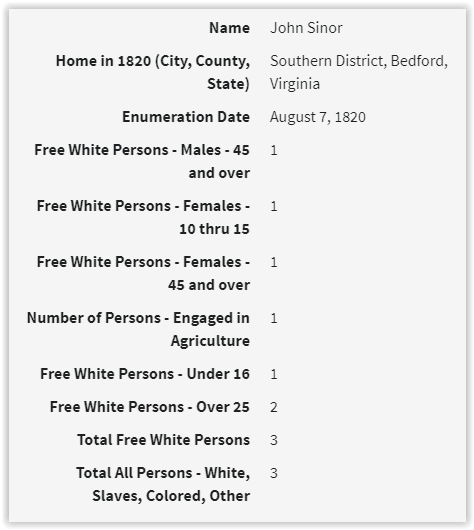 The database record for John Senar gives William Senar as his father. 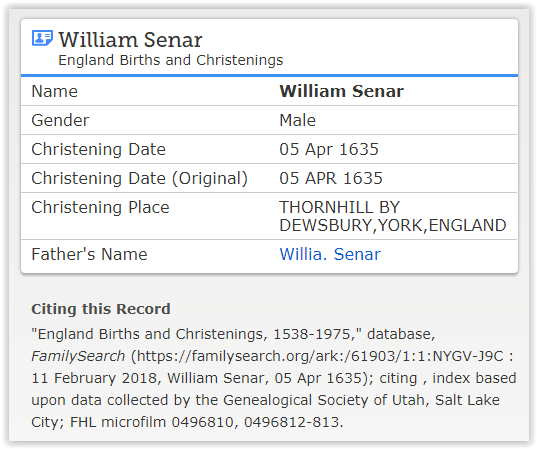 Again, the same database records give a William Senar born in 1635, obviously not the father of John. If there is a relationship at all, it would be that John and William are brothers rather than parent and child, with neither of them being a parent of Joseph. While it is possible that this information is accurate and does apply to Joseph Sinah, it is difficult to tell if this very different spelling than used elsewhere is about him and his wife, Mary, without additional corroborating documentation. 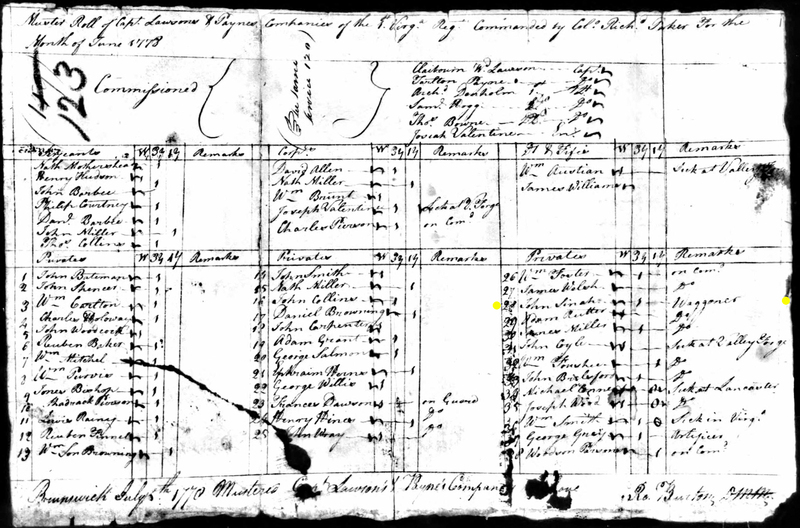 Parish Register of Christ Church, Middlesex County, Va.